Hughes, 54, resides in St. George, Utah, where he works at Moto Zoo Powersports and also runs his own adventure and fabrication shop called Offroad 365, the latter of which is a name fitting of his lifestyle. Hughes, who also is the local high school’s mountain bike racing team coach, said he was disappointed when he learned a technical, rock–wall climb, he felt confident in scaling with the Maverick Sport X rc, was removed from qualifying. And the new qualifying run setup was more of a short-course, desert loop that favored all-out speed. Despite the challenging starting spot, Hughes knew he would have to shine in the rocks to gain ground, while also holding his own in the desert sections. 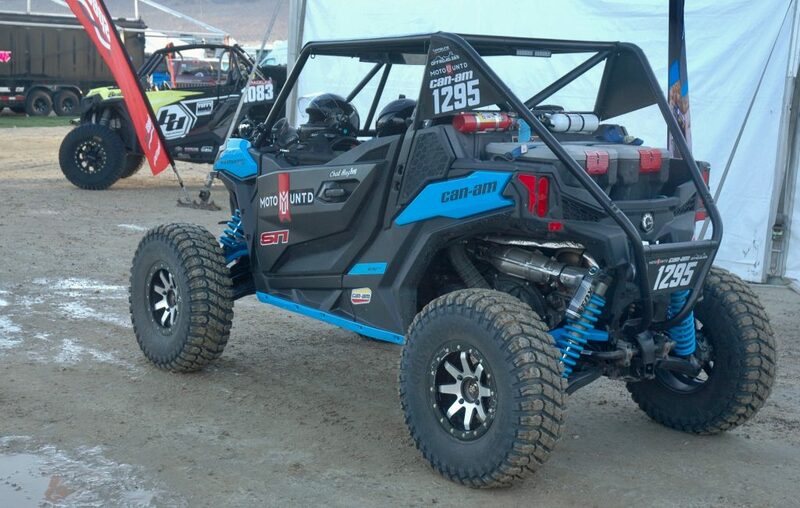 After the race, Hughes shared with us that his Can-Am was nearly 90 percent stock and that he just fabricated and installed a few accessories and those mandated by Ultra4 Racing. His modifications list is not a lengthy one like you’d read on many of the other vehicles competing in the Can-Am UTV King of the Hammer racing event. 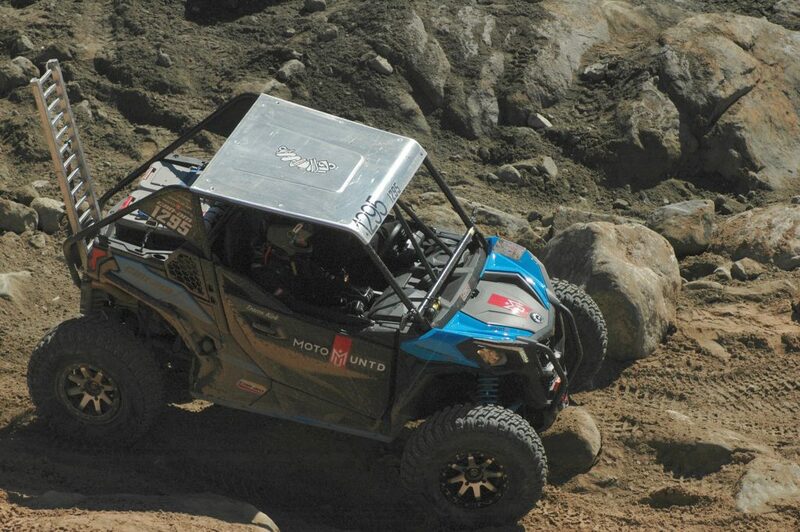 Hughes, who has a history with customization having built one-off rock buggies and JEEPs,swapped the stock Maverick X rc ROPS for a 6-point DOM safety cage with a nearly 2-inch diameter, added the necessary harness system, safety nets, fire extinguishers, flashing race light and, of course, the mandatory properly placed race numbers. 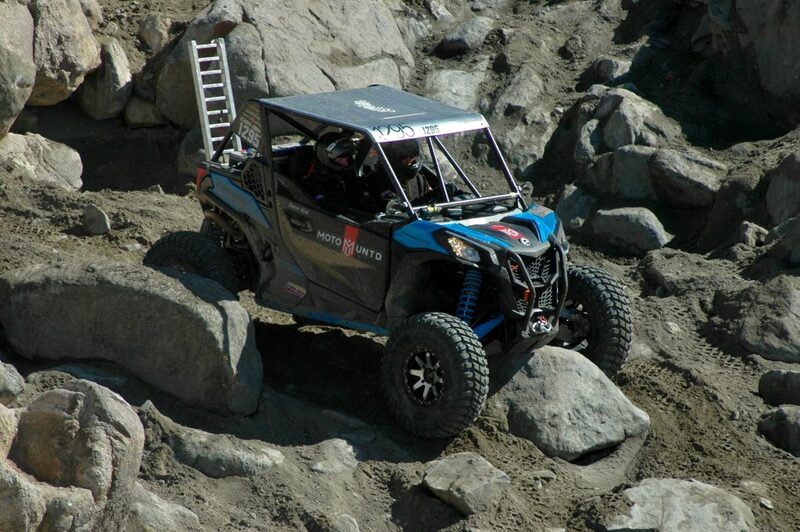 To customize the Can-Am Maverick Sport X rc to his liking for the KOH rocks, Hughes went with an STI tire-and-wheel kit. The 3-in. larger tires and offset wheels added a little more ride height, clearance and width. 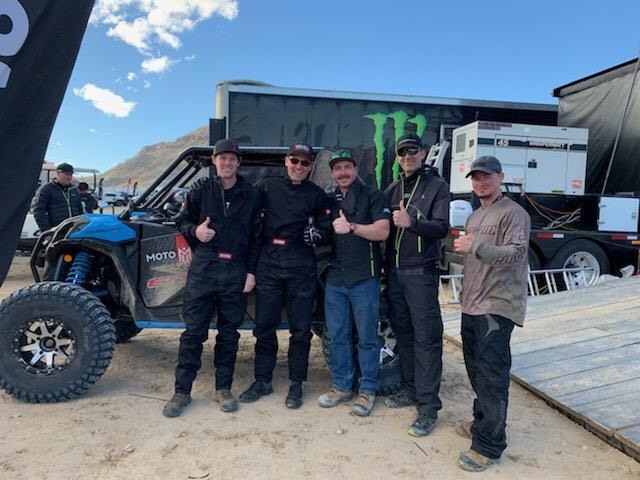 From left) Tracon Kirk, co-pilot and Chad Hughes, celebrate with François-Charles Dumas, Michael Tissier and Jean-Luc Savard after the racing tandem finished the 2019 Can-Am UTV KOH race in his nearly stock Maverick Sport X rc side-by-side vehicle.